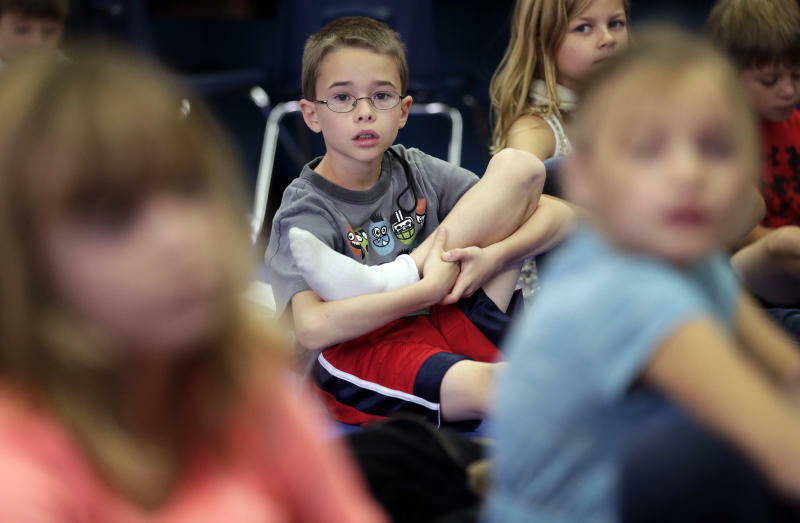 ENCINITAS, Calif. (AP) — Public school yoga instructor Katie Campbell proudly looks out at 23 first graders as they contain their squirming in a kid-friendly version of the lotus position. In a voice barely above a whisper, she says into her microphone: "Why look at everyone showing me they're ready for yoga. A-plus, plus, plus!" Then the lesson begins with deep breathing and stretches common to many yoga classes. But there is no chanting of "om," no words spoken in the Indian language of Sanskrit nor talk of "mindfulness" or clasping hands in the prayer position. 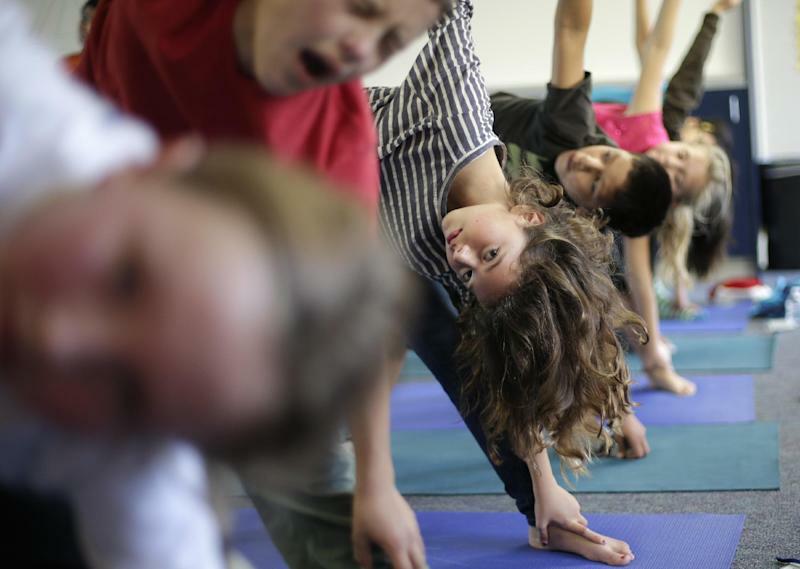 Campbell avoids those potential pitfalls for the Encinitas Union School District, which is facing the threat of a lawsuit as it launches what is believed to be the country's most comprehensive yoga program for a public school system. Parents opposed to the program say the classes will indoctrinate their children in Eastern religion and are not just for exercise. It's a debate public schools across the country are increasingly facing with the rising popularity of the practice and the recent dispute over school prayer. Yoga is now taught at public schools from the rural mountains of West Virginia to the bustling streets of Brooklyn as a way to ease stress in today's pressure-packed world where even kindergartners say they feel tense about keeping up with their busy schedules. But most classes are part of an after-school program, or are offered only at a few schools or by some teachers in a district. Encinitas is believed to be the only public school system that will have yoga instructors teach full-time at its nine schools as part of an overall wellness curriculum that includes nutrition and a school garden program, among other things. "This is 21st century P.E. for our schools," said Encinitas Superintendent Timothy B. Baird. "It's physical. It's strength-building. It increases flexibility but it also deals with stress reduction and focusing, which kickball doesn't do." The program is expected to teach a 30-minute yoga lesson to roughly 5,000 students twice a week at the district's schools, which run kindergarten through sixth grade. It is funded with a $533,000 grant from the Jois Foundation, a nonprofit whose board of directors includes the son of the late Indian instructor Krishna Pattabhi Jois, whose teachings are said to have popularized Ashtanga yoga in the Western world and were followed by Madonna and Sting. Jois Foundation's program director Russell Case said Encinitas is building a national yoga model for public schools. "Kids are under a lot of stress. There are a lot of mandates on them to perform. We think it would be extremely helpful to have 10 to15 minutes possible to sit and be reflective instead of go, go, go," he said. Researchers at the University of Virginia and University of San Diego will study the program, including analyzing data on students' resting heart rates. They want to know if public schools can impact not only children's learning, but instill in them good eating habits and skills to help their well-being. The program started in several schools in September but will go district-wide in January after months of protests by a group of parents. Mary Eady pulled her first-grade son out of the classes. Eady said she observed a kindergarten class in which the children did the motions referred to in yoga practices as a sun salutation. The folded over children, stood upright, sweeping up their arms toward the sky. She said while the teacher called it an "opening sequence" the connotation was the same in her mind: Students were learning to worship the sun, which went against her Christian beliefs that only God should be worshipped. "It will change the way you think," she said. "What they are teaching is inherently spiritual, it's just inappropriate therefore in our public schools." Their attorney, Dean Broyles, says they are considering suing to halt the program. Despite the long debate over prayer in school, constitutional law experts say the courts still have not clearly defined what constitutes religion. "You might get litigation on a program like this because it's not totally settled what the boundaries of religion are," said New York University law professor Adam Samaha. He points to the 1979 ruling by a federal court that blocked transcendental meditation classes from being taught in New Jersey public schools, deeming those particular lessons to be religious. But the court did not go so far as to rule that meditation in general is and Samaha thinks courts would not deem yoga a religious practice. If they did, it would open the door to scrutinizing a host of activities. "It's practiced by enough people, who probably don't believe they are engaging in a religious practice," he said. Still, Encinitas Assistant Superintendent David Miyashiro said administrators are not taking any risks. "In light of all the attention, it's not enough to remove things with cultural references but also anything that can be perceived by onlookers as a concern," he said. "We think it's important to keep this program in our schools and we're going to do what we can to protect it." At Flora Vista Elementary School, those precautions were apparent. "Spread out, we're getting ready for some airplane," Campbell said as the children laid on their mats face down and spread their arms, arching their back and then flopping back down. Later she said: "now push back to downward dog." At the end, the children sprawled on their backs to relax like a "pancake" as the lights went off. There were soft giggles. Some wiggled in the dark or fiddled with their socks. "We're like melting cheese," Campbell reminded the students. Principal Stephanie Casperson said fewer children now come to her office for acting out. "I have teachers who say before a test now students do yoga to calm themselves so they're transferring it into the classroom, into their lives," she said. During a recent fire drill, 6-year-old Sylvia Lawrence said she folded over into a yoga position under her desk. "It made the fire drill more fun," she said. Maria Walsh, 11, said she was never into other sports. "It's just a fun way for me to exercise," said the freckled, blond-haired girl with a big smile.